Introduction to the Cash Flow Statement, What Can the Statement of Cash Flows Tell Us? Depreciation moves the cost of an asset to Depreciation Expense during the asset's useful life. 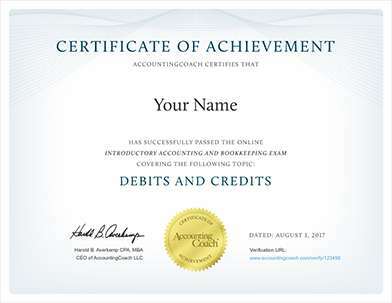 The accounts involved in recording depreciation are Depreciation Expense and Accumulated Depreciation. As you can see, cash is not involved. In other words, depreciation reduces net income on the income statement, but it does not reduce the Cash account on the balance sheet. Because we begin preparing the statement of cash flows using the net income figure taken from the income statement, we need to adjust the net income figure so that it is not reduced by Depreciation Expense. To do this, we add back the amount of the Depreciation Expense. Depletion Expense and Amortization Expense are accounts similar to Depreciation Expense, as all three involve allocating the cost of a long-term asset to an expense over the useful life of the asset. There is no cash involved. In the operating activities section of the cash flow statement, add back expenses that did not require the use of cash. 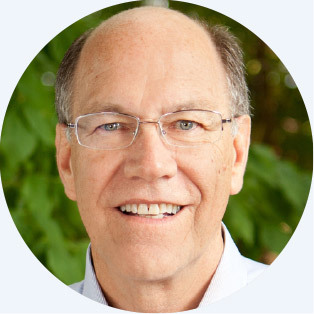 Examples are depreciation, depletion, and amortization expense. 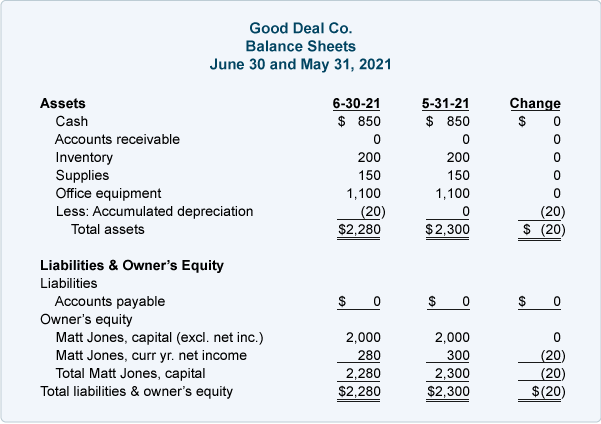 Letâs illustrate how a depreciation expense is handled by continuing with the Good Deal Co. 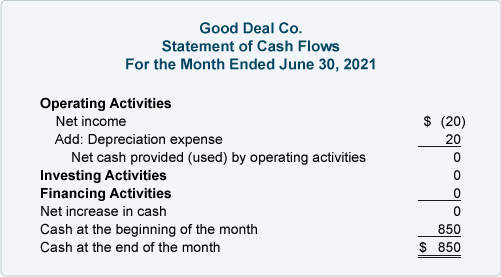 The cash flow statement for the month of June illustrates why depreciation expense needs to be added back to net income. 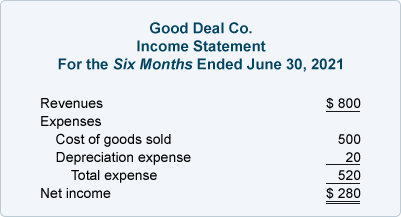 Good Deal did not spend any cash in June, however, the entry in the Depreciation Expense account resulted in a net loss on the income statement. 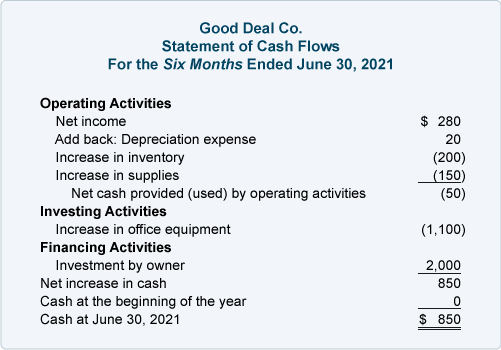 To convert the bottom line of the income statement (a loss of $20) to the amount of cash provided or used in operating activities ($0) we need to add back or remove the depreciation expense amount. The operating activities section starts with the net income of $280 for the six-month period. Depreciation expense is added back to net income because it was a noncash transaction (net income was reduced, but there was no cash spent on depreciation). The increase in the Inventory account is not good for cash, as shown by the negative $200. Similarly, the increase in Supplies is not good for cash and it is reported as a negative $150. Combining the amounts, the net change in cash that is explained by operating activities is a negative $50. The increase in long-term assets caused a cash outflow of $1,100 which is reported in the investing activities section. There were no changes in long-term liabilities. 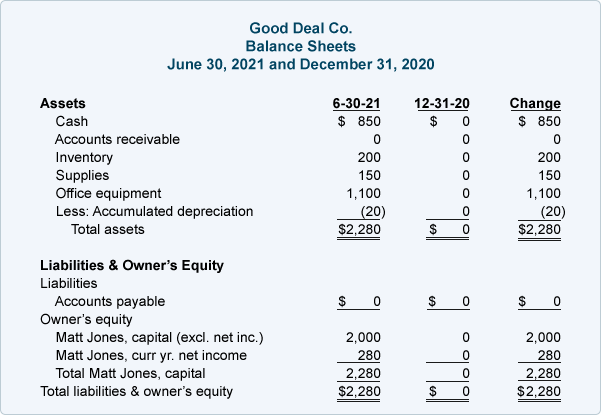 There was a change in owner's equity since December 31, and as a result the financing activities section reports the owner's $2,000 investment into the Good Deal Co. Combining the operating, investing, and financing activities, the statement of cash flows reports an increase in cash of $850. This agrees with the change in the Cash account as shown on the balance sheets from December 31, 2017 and June 30, 2018.